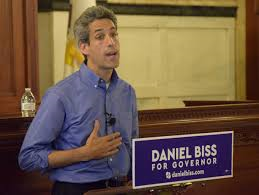 glen brown: Thinking about voting for Daniel Biss in the next Illinois gubernatorial election? Thinking about voting for Daniel Biss in the next Illinois gubernatorial election? “…The debate over Biss' [pension reform] bill seemed to turn on the question of constitutionality because the bill imposed a reduced COLA as well as increased employee contributions and raising the retirement age incrementally for any employee younger than 45. Biss admitted he was ‘pinning his hopes on the fact that the courts would take Illinois' fiscal crisis into account and balance the pension protection language in the Illinois Constitution against the other obligations of state government under the constitution…’” (IASA Capitol Watch, March 20, 2013). “I’m interested in pension reform because the first two years of my service in the Illinois General Assembly were years that followed a very significant tax increase and yet saw extremely deep cuts in discretionary spending to areas of public service that I cared deeply about, the reasons that I entered public service in the first place. The size of our pension payments was so large that if we tried to address our budget problems without looking at pensions, we would be signing ourselves up for deep and never-ending impacts on the rest of state government. I just couldn’t get to a place where that seemed acceptable. I sought out changes to the pension system that ultimately strengthened and preserved it for those who rely on it the most… ” (Daniel Biss, January 2014). “If you’re close to retirement, moving the retirement age is a lot to ask. If someone is 59 and planning to retire at 60, changing their retirement age is changing their life in a really extreme way. On the other hand, telling someone who’s younger, say 40, just doesn’t seem as much to ask, particularly in a climate where other workers in the private sector are retiring later” (Daniel Biss, January 2014). “Part of the challenge for a place like Illinois, because we have so much debt, is that an unbelievably large portion of our liability is associated with workers and retirees who are over the age of 60. In other words, the vast majority of our unfunded liability is to retirees. What this means is that changing the retirement age just can’t move the needle significantly enough on the cost side. We were asked, ‘How can you possibly touch retirees?’ but once you realize that two-thirds of our liability is associated with people over the age of 60, it doesn’t seem plausible to make a significant fiscal change while leaving retirees untouched…” (Daniel Biss, January 2014). "You’ve probably heard me talk about our looming retirement crisis. Half of Illinois' private sector workers — 2.5 million people — lack access to employer sponsored retirement plans. Researchers estimate that nationally our retirement savings deficit is between $6.8 and $14 trillion… This is a huge crisis, approaching us with terrifying speed. If we don’t do something about it, we’ll be facing an epidemic of seniors living in poverty, with horrific human consequences, not to mention huge costs to government. Fortunately, there are common sense ways to address this. That’s why I spent the last two years working to pass the Secure Choice Retirement Savings Program in Illinois. It creates an automatic enrollment IRA so that workers without employer sponsored retirement plans still have an easy way to save for retirement using a payroll deduction and benefiting from low fees…” (Daniel Biss, December 2014). “[Any] attempt to denigrate the validity of decades of judicial precedents about the binding nature of legislation establishing pension commitments to government employees and to motivate state courts to overturn long-settled premises about these commitments would impose its own, unjustifiable costs. The states and their instrumentalities have promised pension benefits to their employees; those employees have relied on those long-standing promises; and as a result the citizens of the states have benefited from the services provided by those employees. [In short,] there is no sound public policy reason to conclude that these promises – based on the reasonable expectations of the contracting parties – should not be fully protected by the laws prohibiting or limiting the impairment of contracts” (Greenfield, Douglas L., Lahne, Susan G. (2012). How Much Can States Change Existing Retirement Policy? In Defense of State Judicial Decisions Protecting Public Employees’ Pensions. National Council of State Legislatures Legislative Summit). “[The Pension Protection Clause was approved by the Constitutional Convention and ratified by the people of Illinois. Over the years, the Illinois Supreme Court has had several occasions to interpret the Pension Protection Clause. The Illinois Supreme Court’s decisions have been consistent: ‘[T]his court has consistently invalidated amendments to the Pension Code where the result is to diminish benefits.’ McNamee v. State, 173 Ill. 2d 433, 445 (1996). That is because, under the Pension Protection Clause, the ‘contractual relationship’ between a retirement system member and the State of Illinois is ‘governed by the actual terms of the Pension Code at the time the employee becomes a member of the pension system.’ McNamee, 173 Ill. 2d at 439. “[In a strikingly similar context, the Illinois Supreme Court also has warned: ‘No principle of law permits us to suspend constitutional requirements for economic reasons, no matter how compelling those reasons may seem.’” (Jorgensen v. Blagojevich, 211 Ill. 2d 286, 316 (2004) (from the 12-page legal document recently filed by the law firm of Tabet, DiVito & Rothstein on behalf of the plaintiffs named from the IRTA and IASA)]. Your oath of office that you have chosen to ignore, Senator Biss: “Each prospective holder of a State office or other State position created by this Constitution, before taking office, shall take and subscribe to the following oath or affirmation: ‘I do solemnly swear (affirm) that I will support the Constitution of the United States, and the Constitution of the State of Illinois, and that I will faithfully discharge the duties of the office of…to the best of my ability’” (The Constitution of the State of Illinois, Article XIII—Oath or Affirmation of Office, Section 3)]. Someone should ask Born-Again Progressive Biss why he did not co-sponsor House Joint Resolution Constitutional Amendment 0002 (for a “Progressive” Income Tax) in January-February of 2013. The sponsors were Naomi D. Jakobsson - Barbara Flynn Currie - Elgie R. Sims, Jr., Linda Chapa LaVia, Robyn Gabel and Esther Golar. Just saying since he’s a state senator he wouldn’t co-sponsor a bill in the House. The co-sponsors were all from the House and not the Senate since that’s where the bill was written. Biss was a representative before he became a senator. Yes. True. But he was elected to the senate in 2012 and the bill your referencing you state was in 2013, no? Biss was sworn in as a senator on January 10, 2013. Huge contributions from Stand for Children. Public employees and retirees will not forget that Biss sponsored an unconstitutional bill to diminish and impair their benefits and rights to a defined-benefit pension. Biss also voted for a bill to eliminate the state workers' compensation system and to terminate their collective bargaining rights.